This beautiful panel is from a scenic called Le jardin d’Armide, the Garden of Armida. Printed in the mid-19th-century by the French manufacturer Manufacture Jules Desfossé, its title is derived from a location in the 16th-century Italian epic poem Jerusalem Delivered by Torquato Tasso. The work was a late example of the romance, recounting the mythic exploits of the knight Rinaldo in the First Crusade. Jerusalem Delivered borrowed elements from both medieval, Renaissance, and Greek epics. The scene where Rinaldo falls under the spell of a sorceress named Armida, who falls in love with him and traps him in her enchanted garden, echoes the tale of Odysseus and Calypso in the Odyssey. In this scenic, the garden is depicted in a triptych, where the Cooper-Hewitt panel would be used to flank a large central scene composed of several panels. The Musée d’Orsay preserves an example of this central scene, of which the Cooper-Hewitt also has some fragments. As can be seen by the trellis and the elaborate Baroque chandelier and statue in these panels show, the scenic was not meant to accurately depict the garden described in the poem but instead evoke its splendor and luxuriousness. The poem was still well-known at this time, commonly depicted in academic art. 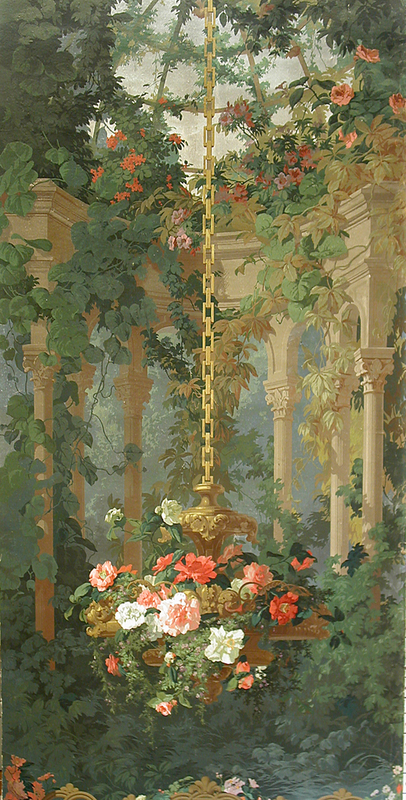 Interestingly, various scenes from the poem were previously depicted in a scenic by the French wallpaper firm Dufour et Leroy. A panel from that scenic preserved in the Musée des Arts décoratifs in Paris is depicted below. The beauty and detail of this paper betrays that it was designed by a painter, Édouard Muller, who created several scenics for Manufacture Jules Desfossé and Zuber et Cie. Manufacture Jules Desfossé was founded in 1851 but changed its name to Desfossé et Karth in 1863 after Desfossé partnered with Hippolyte Karth. The manufacture specialized in elaborate scenics, and they produced both original designs and reprints of older scenics by firms like Zuber and Dufour. In this way, they would reprint with great success Dufour’s legendary Psyche panels. Desfossé et Karth continued to produce scenics until they closed in 1947, and several panels in the Cooper-Hewitt collection demonstrate how the firm would continue printing the same series they created in the mid-19th-century into the early 20th century.